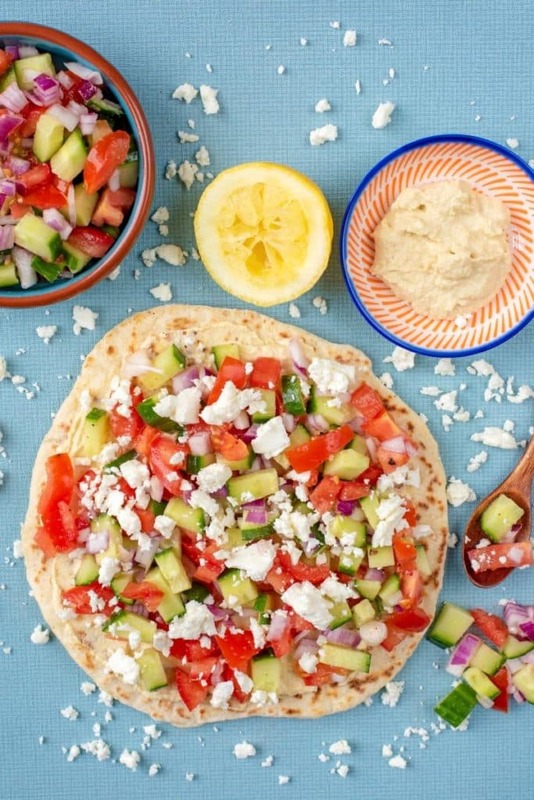 Lunch time never has to be boring again with these Greek Hummus Flatbreads. Easy to adapt, loaded with hummus and ready in minutes. They are packed full of colour and Greek flavour and sure to be a crowd-pleaser. This flatbread has pretty much all of my favourite things on it. The only thing it was missing is olives, which we will definitely be adding next time. But it has feta and feta and hummus are a match made in heaven. This isn’t so much a recipe, as it’s really simple and you just assemble it. But you guys have asked for more lunch recipes that are suitable to take to work, so that is exactly what we are going to give you. This recipe came from one of those days where hunger just creeps up on you and you need something immediately. We usually have some kind of bread in the kitchen and some hummus and salad in the fridge, so this got thrown together. Of course we always have some feta too. You can easily adapt it to use any kind of dip instead of the hummus, or add more of a green salad instead of the tomato and cucumber mixture. We used homemade flatbreads to make this. They are so easy and just 3 ingredients. 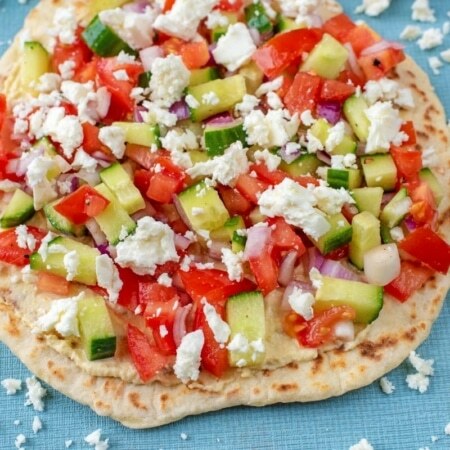 Give these Easy Homemade Flatbreads a try! Want to give this Greek Hummus Flatbread even more Greek flavour? Make a super Greek flavoured hummus to go with it. Mix some oregano and olives in to the hummus and you could even use fava beans instead of chickpeas to make the hummus itself. I’m not going to lie, this isn’t the easiest thing to eat as it’s more of an open sandwich, or you could fold up up as a giant taco, but all the best food is a little bit messy in my opinion. To make it a little easier to eat, swap the flatbread for a pita bread and stuff it full of hummus and the cucumber and tomato salad. This would be a great lunch to feed a crowd. Just put all the separate parts on the table and let everyone build their own. Just make sure there is plenty of feta to go around, because you know how over enthusiastic some people can get with a “sprinkling” of feta (me). 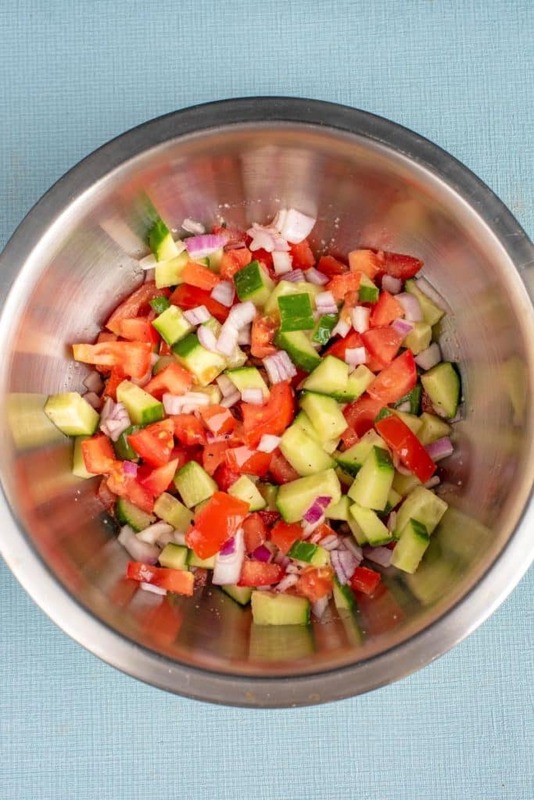 One: In a bowl, mix together the tomatoes, garlic, cucumber, red onion, lemon juice and salt and pepper. Two: Spread the hummus on to the flatbreads. Three: Top the flatbreads with the tomato and cucumber mixture. Four: Crumble the feta on top. Make these even more Greek by topping them with some chopped olives. Use different flavoured hummus to change it up each time. If you wanted to make these vegan, then skip the feta or use a vegan alternative. Meat eaters can easily add some chunks of grilled chicken to this if they can’t handle a meal without meat. 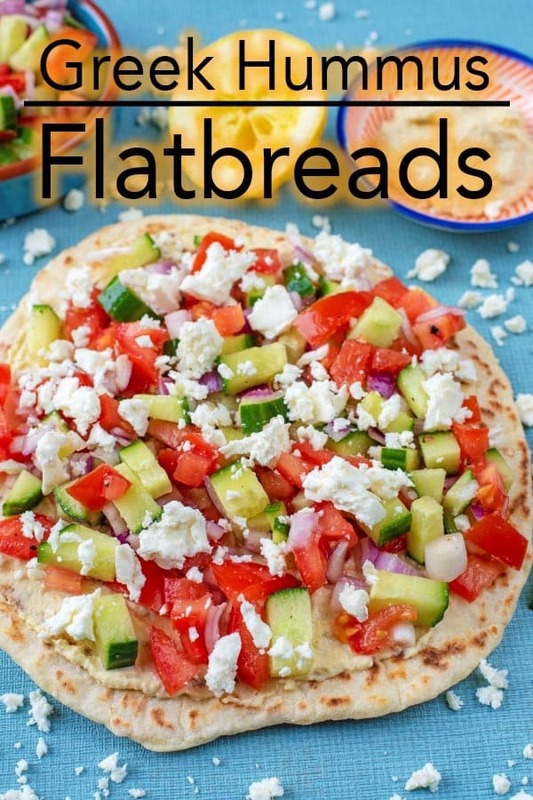 Don’t like the mess of a flatbread? Use a pita instead and stuff the ingredients inside. 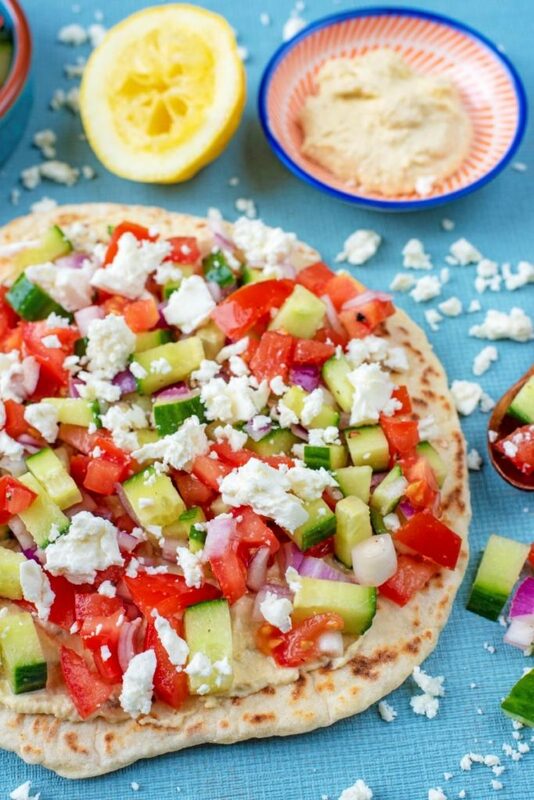 Do you want to be kept up to date on more delicious posts like these Greek Hummus Flatbreads? Please subscribe to the blog mailing list (it takes 30 seconds). If you’ve tried these Greek Hummus Flatbreads, or any other recipe on the blog, then let us know how you got on in the comments below, we love hearing from you! You can also FOLLOW US on FACEBOOK, TWITTER, INSTAGRAM and PINTEREST to see more delicious recipe ideas, behind the scenes shots and also what we are getting up to. Lunch time never has to be boring again with these Greek Hummus Flatbreads. Easy to adapt, loaded with hummus and ready in minutes. In a bowl, mix together the tomatoes, garlic, cucumber, red onion, lemon juice and salt and pepper. Spread the hummus on to the flatbreads. Top the flatbreads with the tomato and cucumber mixture. If you wanted to make these vegan, then skip the feta or use a vegan alternative. You will also need to use vegan yoghurt in the flatbread. Meat eaters can easily add some chunks of grilled chicken to this if they can't handle a meal without meat. Don't like the mess of a flatbread? Use a pita instead and stuff the ingredients inside. This sounds like such a delicious flatbread – I’m a big fan of both flatbreads and hummus so this is a perfect dish for me. Definitely going to make this for myself and the kids. I am so trying this soon. This is so me! Delicious and finger licking good. Love all the greek flavors in this! I could seriously eat these everyday .. I love everything on them and love love love flatbread! Yum! This is pure perfection! I love hummus, all things Greek, and alllll the bread! Can’t wait to make these! I absolutely love recipes like this. So simple, light, and refreshing! I’m due to make a batch of hummus this week, so I’ll be putting it to use with this for SURE. Love hummus and love flatbread, so this looks just perfect! Can’t wait to give it a try! Love everything about these! What a great way addition to our lunch rotation! I LOVE flatbread so much! and all these ingredients too… what a fabulous, fresh meal! Wow, does this look good! I love all of those ingredients! Yum! I need some of these for lunch now. Love everything on them and so bright and colorful as well. Simple & nutritious is something you can never go wrong with. Oh nooo, Dannii, the olives!!! LOL! Don’t worry – this still looks amazing. It’s a great idea. 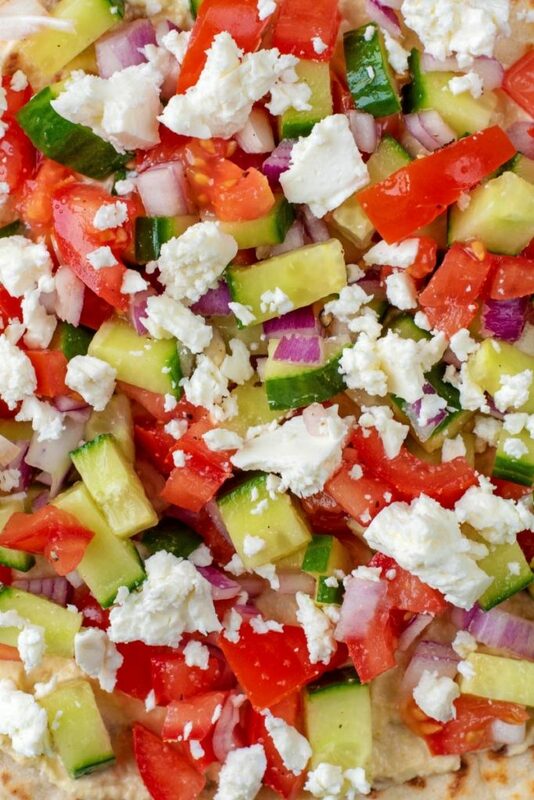 Feta livens everything up! Ooh that hummus looks so good, so smooth and creamy! Is it homemade? Love the idea of using hummus on pizza!